M6 evo kit will probably be their choice imo! I agree to you!!! M6 evo kit is very strong update kit for M6 GT3. It modified the suspension, differential and brake system, and also made aerodynamic adjustments. By they way, how come the evo package is available in two variants one? Maybe one kit is for sprint and one for endurance with several differences hence the different pricing. Subaru BRZ (#61) had suffered an accident after retiring Thailand race. An official's winch broke, and hanged chassis fell from 50 cm height. Although It is unclear whether this was the cause, they had a brake trouble in Motegi. Front brake didn't work, so rear tire had locked. They had a trouble caused by trans-axle drive train through this season. Team RQ's (#22) is selling its SLS GT3 at Yahoo! auction. It means that Team RQ's (#22) will withdraw SUPER GT right? I hope they will buy a new chassis. But the problem is the price , then I want to ask you , what is the business for the team RQ'S? And what is the main sponsor for Team RQ's? At least, he was almost professional driver before. Hirate is writing his personal resume by Japanese and English. He might leave from team SARD? Carguy racing (Super Taikyu team) might participate in GT300 next season. Last edited by Japanese Samurai; 25 Nov 2017 at 12:35. Another strong potential entry into GT300 next year - remember it was CarGuy Racing who showed up the Blancpain GT Asia regulars at Fuji with a win on debut! 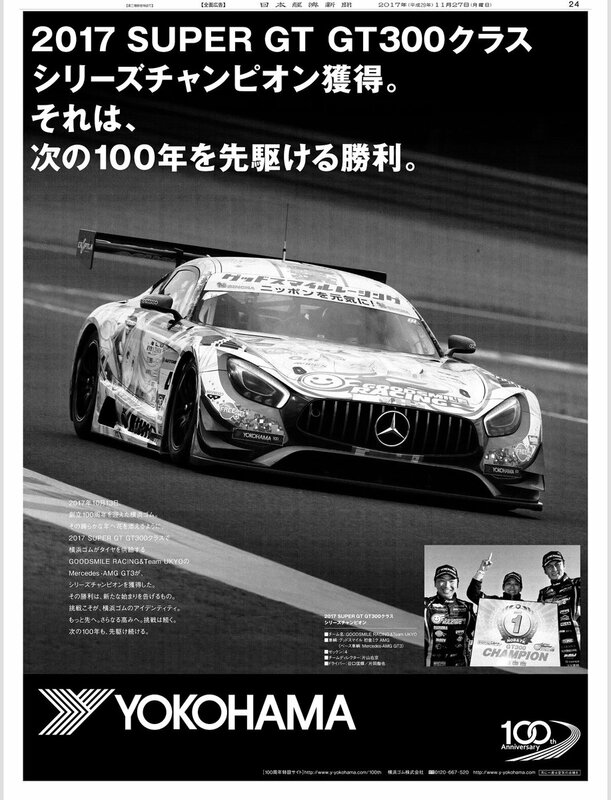 Yokohama tires advertisement in Today's Nikkei Shimbun (newspaper). "2017 SUPER GT GT300 class series champion acquired. This is the victory which becomes a trigger of the following 100 years (of Yokohama.)" They sure love their hyperbole at Yokohama. This year is 100th anniversary of Yokohama tire establishment. However, Yokohama had a tough season because they couldn't even get on podium in GT500. So GT300 car had to be a trigger of following 100 years.